Great care is taken during this, the final phase of the project. All joints and fastener spots are sanded first with a pole sander using 150 grit sandpaper, never sandscreen. It has been our experience that screen leaves unsightly grooves in the finished joints and corners. The job is completed using hand sanders and 100 watt light bulbs as well as natural light for an optimum finish. Texturing is done using a variety of methods and materials. Drywall is closely inspected for imperfections during sanding. Final inspections are done with revealing light systems. 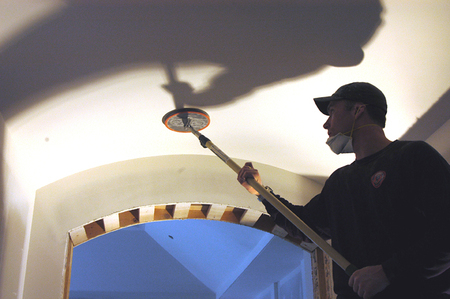 Walls and ceilings are properly prepared for priming and painting.